I enjoy a good mystery. A lot. In fact, without even knowing that there were 6 other books in the Maggy Thorsen coffeehouse mystery series, I requested a review copy of Triple Shot, which is the 7th. I loved it so much and not once did I feel that I was missing part of the story just because I had not read the previous books. I felt very comfortable reading it as a standalone. Maggy Thorsen is a coffeehouse owner in a small town in Wisconsin where everything seems to be quiet and mundane, but nothing is further from the truth. Someone is killing real estate agents, out of all people, and Maggy takes a special interest in the case once the body of one of these victims show up right under her nose. This book was so hard to put down. I went through it so quickly and was so entertained and intrigued by it and I stayed up late last night just because I couldn't stop reading this book. The characters, the mystery, and the plot twists captivated me from the first page. 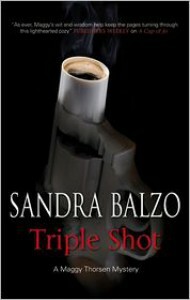 All of the characters are unique in their own way and Sandra Balzo does such a great job of clearly painting that picture for you. What I loved most about the main character, Maggy, is that she's not your usual know-it-all heroine. In fact, Maggy is so flawed, she keeps pointing it out to herself as she narrates the events in the book. 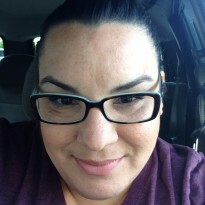 She's quirky and definitely not a people person, but has an inquisitive nature and a knack for putting two and two together that can put the entire police department to shame. I am definitely going to pick up the rest of the Maggy Thorsen Mystery novels because I just cant get enough. I want to know more about Maggy and her adventures at Uncommon Grounds, the name of the coffeehouse she co-owns and where she developed her signature "Triple Shot". I very rarely give a 5 star rating, but this book deserves it. I don't normally read books not in the YA genre (which this book is not, by the way), but once in a while I break off wanting to find something different, a palette cleanser if you will, and I found it with this book. Highly, highly, recommended. The book will be out in stores today, so if you're looking for a very entertaining mystery to read, you've found it.